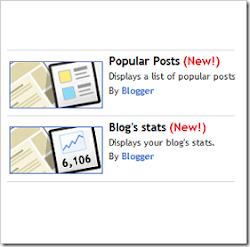 It has been almost 2 months since Blogger introduced the “Stats” feature. Now they have gone a step further by introducing 2 Gadgets related to the “Stats”. Blogger has now got a “Popular Posts” Gadget and a “Blog’s Stats” Gadget. (These are currently available only on Blogger in Draft). How to add these Gadgets to your blog? What do you think of the ne Gadgets? When I first added the "popular posts" gadget, it cut off the left side of the titles of the posts. I think this was because I was still using one of the old design templates. I switched to one of the new ones using the "new" template designer and the problem went away. I'd been meaning to switch anyway, so having this happen was a good occasion to update my look. nice widgets, i'm using right now, thanks. is it possible to customize css,tags or snippet's length so it will look better? Thanks for the heads up! Wish they had a gadget that would display a list of posts that used one label. This way you could label a post "favorite" and the gadget would show all posts with that label. I get these two widget yesterday when i am working in my blogger. yeh that's are good and Like it. There are not available in my dashboard! Popular Posts Gadget: how can I reduce from 10 to 5? Blog’s Stats Gadget: Why total pageviews? I would like to show the latest 30 days only. Like the popular posts gadget! is it possible to customize this widget? for example how many posts it shows? This is a really great widget. Google is adding some great features to keep the blogging platform relevant. Love the idea .. mine is cutting off one or two spaces on the left margin. If this can get fixed, I will definitely use this. Also, the recent posts widget is still not working completely in internet explorer. It works on Chrome and Firefox just fine. In IE, the widget works fine on the blogger homepage but not an individual blog page. Will you be fixing this in bloggerindraft soon? Thank you! Thank you so much! This better reflects my top posts. I've been using Postrank's widget. Hey Aneesh, how can we custumize the popular posts widget like displaying 5 posts instead of 10 and changing character count for title and snipet? wow its a powerfull gadget.. This one is pretty awesome. Blogger is now innovating hard to satisfy their users. Hi aneesh,is it possible to add loading background image on post body,before the content loads fully? Thanks for sharing, great features from blogger. Just wonder how to disabled the thumbnail. it doesn't want to save the settings. after adding this one, all other things gone up! Only showing most read articles...how can i show visitors count, and all other titles together? I think they've removed the popular posts widget again.I guess it was short lived. How about for classic blogger? hi aneesh, this widget seems doesn't want to follow instruction..i already added this widget WITHOUT SNIPPET AND THUMBNAIL, but it is not working..
still, it appears with snippet and thumbnail..
Popular how can I reduce from 10 to 5? Popular Posts how can I reduce from 10 to 5? do you people really not know how to reduce popular posts from 10 to 5? seriously? It would be nice to extend this great gadget with more configuration options like in the Recent Posts gadget. First of all, the "External Blogger URL" field. Using it and I think this is great however I'd really like to be able to use this as a horizontal list with just the blog post title and a picture. Is there a widget that is similar but lets you specify which posts you want displayed? i like this, but i dont want add a post name within. just thubnail. i more like your recent post. but its recent.. I have using this widget with great success. Unfortunately, for the last week period, is not showing correctly the top 10 posts according to blogger stats. It is not being updated with the correct top 10 posts. Anyone has this problem or know what to do? this widget is awesome, but some of the thumbnails started to vanishing, and new thumbnails for new posts aren't generated- it's the same after I reinstalled the gadget, and the random posts widget on this site also had the same problem when I tried it- anybody know what's the problem? Hi! I installed this widget but a few text on the left hand side overlaps the template. How can this problems be fixed? Can you please provide the script of this widget? I want to add this widget in the tabbed navigational sidebar and I need the code for that. So, please help me regarding this. It seems for the past few weeks it is not working as it should, does not show the most popular from last 30 and 7 days, and the most popular of all time is not being updated! any thoughts on how to fix it? the popular post widget Not working on my blog anymore since my popular posts cannot be fetched beacuse it has adult content and i have to put a warning page. Hope blogger will work on that. Thanks..
My popular post was broken. It wasn't display. Why ? I would really like the Popular Posts widget to allow more than the 10 most popular posts to be shown. Say, 20, or ideally, any arbitrary specified number. I need POPULAR POSTS BY LABELS widget..
Popular Post title comes up untitled. Need your help. Thanks for this post. I am using it now. Can someone tell me how the most popular posts are determined? Is it by page views or comments or what? hi, popular post widget is not updating, can't seem to find any solutions at the moment. Perhaps you can help? appreciate it very much.